Warning: This is not about mysteries, although it does involve a mystery of sorts. Let me start by telling you that I am 5’9″ tall. Invariably when I find myself in a line (like at the grocery store) I am one of the tallest women. There may be a few others who are taller, but usually there aren’t. I don’t wear high heels EVER – I can usually be seen wearing my New Balance walking sneakers. This wouldn’t annoy me if I hadn’t just bought two pair of my regular brand jeans in my previous size >>> “medium” length. I have been buying the same brand and cut jeans for years, so when I bought my two new “medium” jeans this time, I didn’t bother to try them on. I quickly went home and washed them. That’s how sure I was they would fit. Long story short: I am currently waiting for them to be taken up. They are quite long, actually very long. And of course with the price of the alterations, I no longer feel like they are the best jeans I can buy for the lowest price around. OK! I feel much better now that I’ve gotten the rant part out of the way! My husband pointed out that my “Rants & Raves” entries seem to only be the negative “Rant” portion. Yikes! He’s right. Am I really that negative?!? I know I have mentioned how much my husband and I like our Keurig coffee maker (from my These Are a Few of My Favorite Things… entry, and how I fill my Ekobrew refillable K-Cups with my favorite tea blends so that I don’t have to keep paying the high prices for tea K-Cups. Mission accomplished! I managed to not just focus on the negative side of my “Rants & Raves”. That doesn’t mean I’m not still annoyed at having to alter my “medium” (in my opinion “tall”) jeans! First of all I’ve never thought of you being a negative person…enjoy all your posts and hints besides all the book postings. Second – I’m 5’8″ and bought a pair of jeans yesterday in a size that I’ve not worn for YEARS. Same brand, same length (L). I’d like to think I’ve lost a lot of weight but something must be changing in the jean factory! I do like saying the size number out loud though to myself!! PamB, you will notice I never mentioned the size number!!! I can complain about the length which I think is the manufacturers problem, but as far as the number goes >>> that’s my own doggone fault! As someone who is 5 ft. 1 inch tall I often have to either cut off vast amounts of length or if I do find a short length it is sometimes just an inch too short. So I feel your pain. However, the rave about the San Francisco K-cups is a great tip. Thanks. 5’9! You are so lucky, embrace it, you could have been born short like me which is so much worse in life. Nothing ever fits or is the right length and men do not like short women. You are so lucky. Its beyond lucky to be tall. I LOVE MY KEURIG! I tend to purchase K-Cups, but one of my favorite souveniers to bring home from vacations and day trips is tea. Living in the North East we can travel to so many different states so easily and it is wonderful to bring home local teas. Cranberry tea from the Cape, blueberry from Maine, apple and maple from Vermont, peach and jasmin from Georgia (you get the point.) I was skeptical when I first brewed them in the Keurig refillable cup but they brew just as perfectly as the K-Cups. Keurig the greatest invention ever and yes became a little biased since Green Mountain purchased it several years ago;). Margaret M, you just stated the exact reason I wish we lived in the north east. (No, not the teas, although they sound great!) The fact that you can take day trips to different states sounds delightful. It takes us over a day to just get out of Texas. I love your posts and their dynamic quality. Rant or rave whenever. Makes you human. Why are they always messing with womens sizing in clothing anyway. Thank you, Rebecca, I’m glad you enjoy them. I know that some manufacturers of more expensive lines tend to make their sizes bigger, which of course makes the people who buy them happier. But since I buy my jeans at Walmart, I don’t qualify for those type of manufacturers’ tricks. I have the same problem with slacks – I am 5’6″ and wear a “plus” size. Also, I never wear heels – haven’t for decades because of a problem in one foot. When I buy a new pair, I launder them, measure the correct pant length plus one inch myself, using a pair of slacks that are the perfect length as a guide, cut off the excess and take them to the cleaners I use to be hemmed. They do a better job than the alterations person I previously used and for much less cost. Thank you, AndieP, I had never thought to take my pants to the dry cleaners. That really is a great tip! 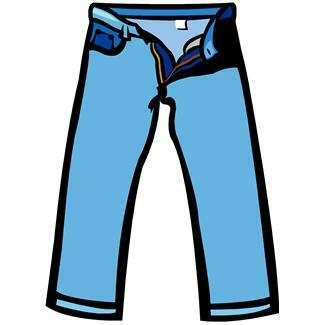 I just wish now that I am getting into mature years and shrinking that I’d saved all the pants that were once too short. It seemed that once you reached a certain size you couldn’t get pants with the length. Do they think only short women gain weight? It looks like now the pants are all getting longer. I don’t get the enormous platform and high shoes that you have to be hanging on someone’s arm to be able to wear. Ann, I don’t get those high heeled shoes, either. Danna, I’m glad to know I’m not the only one forced to wear heels all the time because I can’t find pants the right length (I’m 5′ 7″). I thought I was shrinking. Julia, I doubt I could have shrunk as many inches as the seamstress had to take my jeans up! I was off to the seamstress as well. Makes me very aaargh that men can pick the length of their jeans in inches! Why not women??? You’re not kidding, SousZ! Why is that?!? I was just paging through a Blair’s catalog that was in my mailbox earlier in the week. I noticed their jeans and slacks descriptions list the inches of the inseam for these items (just like they do for men’s jeans/slacks). It appears the inseam inches for their petite size is 28″, some are 28 1/2 inches and regular is 29″, with some at 30″. I don’t know if they have a ‘long’ size. Their prices appear to be reasonable (especially the sale prices). Danna Thank God for your comments about sizes. I am a Very large person and i was always 5′ 7″ inches tall. With age I have shrunk to 5’5″ but between weight and height I have lots of trouble finding pants. If I get average length, I spend $10 a pair to have them shortened.petite are great but usually shortwaisted. Manufacturers think if you weigh a great deal, you must have arms like an orangutan. The sleeves are so long, therefore, another tailoring bill.I could scream with frustration some times. By the way i heeded your suggestion and started reading the series about Phryne Fisher. It is very good. Thank you for your help. Regina, I have a seamstress who does all of my daughter’s suit pants. The seamstress is good, but expensive. I took my jeans to her and she wanted $18 per pair. I found another seamstress who ended up doing my jeans for $10 a pair. I couldn’t justify (in my mind) paying about the same for the altering as the original Walmart jeans cost me. Now I finally know why I can’t find a pair of jeans that are the right length!! I’m 5’5″ and even the short ones are too long sometimes! The only jeans I can find that fit are at the Goodwill store—they must have been already altered or are old ones that were the right length already. The big plus is the price is about 10 percent of the original so now I’m saving lots of money. Sue F, isn’t it absolutely ridiculous! My daughter is my height and has to shorten all of her suit pants. (She doesn’t wear high heels, either.) So, I’m going to continue to blame these doggone stilettos for the problems we all seem to be facing. Good point, Jackie. (You and your husband are just about the same heights as my cousin and his wife.) “Be happy” is the right idea. Just wanted to say: 60 years together! Wow! Way to go! Donna, the jeans I bought were “medium” length. The petites are just right. But that still doesn’t make sense to me… I’m pretty sure that “petite” people” would need to wear high heels with the petite length jeans. What a drag for them to have to wear heels or get the pants altered. I’m thinking the sizing of your jeans are way off…..I’m 5’3″ and on my self imposed empowerment days (which is about 3 days a year), I have a a shorter torso and longer legs…but when I return back to reality for the other days, it is the expanding backside/thighs that makes everything go haywire when buying pants:) If I buy petite jeans, they look like capris and if I buy regular sized jeans, I cannot walk without tripping over the bottom of the jeans. I wish I could get my backside/legs to deflate, but I refuse to give up my nightly chocolate chip cookie dough ice cream habit for blueberries. Stacey T, as much as I like blueberries, they are never going to take the place of chocolate chip cookie dough ice cream! I hate buying pants or jeans of any kind. This is going to sound silly, but I can never get a pair of pants or jeans that fit right. I am 5’7′, but every pant I buy, I have to double over the waistband so the crotch doesn’t t hang down! I did finally find jeans from the Penneys online site that I bought that really fit nice. (No rolling over the waist). But, then they went and changed all the brands they carried! Oh well. By the way, check at Sam’s Club or Costco for k- cups that are much cheaper. You can also buy them them at Bed, Bath and Beyond and use a coupon that they are always sending out. I use the Solofil cup, that way, I can get more variety in decaf coffee. I belong to a group of shrinking women. My mother and I are both getting shorter. She was 4’9 and now is (86 yrs old) and 4’4 and I was 5’7 and now 5’5 at 60 yrs old. If they make a remake of the Incredible Shrinking Woman I’d like to audition for it. Ha ha. Wow, Rose C, it sounds like you could give Lily Tomlin a run for that part! Speaking of weight and height as some bloggers were doing. I want to tell a frustrating (for me) story. When my husband and I married 55 years ago I weighed 100 lbs. less than now . He weighed the same as today. The end result I could not wear my wedding gown today BUT he can still fit into his Marine dress blues that he bought in 1955.Whenever he makes me angry, i promise to bury him in them right now. ReginaV, Your comment reminds me of the Geico commercial where the wife (!!??) is sitting be side the driver (the DH!!??). She is reading the road sign that is advertising the insurance with only a 15 minute phone call. She asks her DH if he knew that and he (of course) says ” everyone knows that.” The wife rolls her eyes and then asks the DH if he knew that owls weren’t all that wise??!! The DH gives an expression that I simply love!! I have a DH that is just like that. Let me try to start a conversation and he almost always will know everything about the subject. Although he has lived in this very small city all his life, has never hunted, has had absolutely nothing to do with deer, he knows all about their habits!! When the deer eat, when they sleep, EVERYTHING. Then he will start to tell me about the deer whether I want to hear it again for the 2ooth time or not!! If he doesn’t know anything at all about any subject that I try to bring up then he will change the subject. Another very good reason that I will be taking my Kindle, a few good books as well as my crocheting along on our trip out west this week. My dad was just like that. And to think my mom and dad were married 61 years before he passed on!! I always think of that when my DH tries to let me know that he knows everything.!! Danna, I do know that what I want to say here might not be exactly what all of you are discussing but– As I wrote a few weeks ago I am 5′ 1″ and half inches short! and weigh 200 pounds. I have never liked me for being this heavy (can’t do much about the shortness, I used to be 5’3″) but until recently I was just not up to going through all the rigamaroar that people have to go through to loose any weight, that is until I got a copy of the picture of my 50th highschool graduation class reunion that I attended in July!! Now, I wasn’t the heaviest person in that picture (I was seated on the front row since I was one of the shortest.) But I was among those in that heavier group.. And I don’t like it even one little bit! My DH and I are going on a vacation that we haven’t been able to afford for the last few years this week. We are leaving here this coming Wednesday after I make sure my SS check is in the bank and we are heading West YOUNG MAN!! Somebody a long time ago told people to do that. I think it was Horace Grealy!!?? We are first going to the area around Paducha, Ky to visit my grandson, my daughter-in-law and then my son’s grave sight. I haven’t been able to afford to visit my son’s grave for almost 5 years. After visiting that area for a few days then we are headed to visit my oldest brother and his daughter’s family that he lives with in Colorado Springs, Colorado. I can hardly wait to see the Rocky Mountains and Pike’s Peak. My brother plans to take us to the top of the Peak on one day of our visit. He told us to bring a heavy jacket for our trip to the top of the Peak. I have those ready!! After staying there a few days then we are going to make our way to Rapid City, South Dakota so that my DH can revisit the Air Force base that he was stationed at during the early 1960’s. Then as we make our way back to good ole Ohio we want to visit Mount Rushmore, and all the sights around that area. After that I want to visit Notre Dame University. I am a VERY Big Notre Dame football (as well as THE University of Ohio State) and I want to get a shirt that is actually from that university. Hopefully I can get a shirt with the Four Horsemen pictured on it. A person can’t buy one of those shirts with the Four Horsemen around here!! A person can find gobs and gobs of Ohio State shirts, of course and I think, an over abundance of Michigan shirts (yee gads!!) But not a whole lot of Irish shirts! I myself think those people who live in Ohio and wear Michigan shirts would buy Ohio State shirts if they lived in Michigan!! People are strange !! We haven’t been on a vacation for quite a while and we have been planning this one for almost a year. It’s hard to believe that the time for us to go is almost here!! We are taking our two little dogs with us on the trip. They both love to go on car rides but for our little toy fox terror (no not misspelled,) this will be her longest trip yet. For our half dachshund/half jack russell, this will be his longest since he was a small pup. He loves to sit on my lap with the window rolled down so he can stick his head out the window! My only concern for taking my dogs on this trip is in finding a motel that will accept dogs. We have to be able to have the dogs stay in the rooms with us. Both dogs would be too scared to stay any place without us. I would worry myself too much to not have them staying in the same room with us. Sorry this is so long. But I am just so excited to be going on a vacation anywhere let alone to interesting places!! Yes I do have my Kindle and other books all ready to go. And I do have quite a few crochet projects to take along. I have a couple of patterns that I am hoping someone somewhere along the way can help me with. When it comes to me trying to crochet a granny square or a ripple pattern I am good until I get to the second row!! Then I am dumbfounded!! I found a few ebooks for DH to read also. I don’t always just think of myself!! I get very nervous driving through some of the bigger cities and since my DH’s driving scares me I can keep my mind on my reading or my crocheting. DH and I will be both happier campers if I leave him to do all the driving, at least through those bigger cities! Anybody have any good tips about traveling that long a distance with dogs??!! Oh, by the way, I plan to tape that highschool graduation reunion picture to the refrigerator after our vacation! Not before time!! I want to be able to enjoy some of the different foods along the way__WITHOUT ANY GUILT!! A few more weeks, hopefully, won’t make much difference!! Wish us well. This vacation has been a long time in coming!! Linda C, I hope you, your husband, and two little guys have a delightful trip. Have you looked online to find motels/hotels that will accept dogs? You can probably find them along your route. My sister and her husband used to take their dog with them whenever they traveled, since she was too big a part of the family to leave her behind. Linda C Have a good time on your trip. One thing to remember while in CO is to drink plenty of fluids. My daughter lives south of Denver and north of Colorado Springs and I have visited her often. The altitiude causes me to be very sick and going up Pikes Peak was a disaster for altitude sickness. My doctor warned me drink fluid and I would feel better. It worked so be sure to do the same. I envy you. I hate wearing pants because I can NEVER find pants long enough. The ones you bought had to have been mismarked. I’m only 5’7” and have fought for years to find pants long enough. Perhaps I am all legs with nothing but leg and neck…squawk! I must look like a bird. ReginaV, Thanks for that tip on drinking plenty of water while going up Pike’s Peak. I think I will have a good supply of Dramamine on hand as well. I don’t know if we will be taking the dogs on that trip up to the peak or not. Maybe it would be better if we leave them both at my niece’s house. We do have two of those nylon dog cages for the dogs so they won’t make a mess of the house while we are gone. Danna, I picked up a travel book from the AAA that lists places that allow dogs. I hope this book helps us out. Here it is Monday, almost 10 a.m. By this time Wednesday we hopefully will be bypassing Indianapolis, heading South towards Louisville!! Ladies, Ladies: to find jeans (or any other pants/slacks) the proper length – here’s a simple solution: guy’s jeans. If you are just getting plain old levi’s or wrangler’s & don’t have big hips, try buying jeans in the men’s dept. They are sized by waist & inseam. I’m only 5’3, and have a 28″ inseam. They fit me perfectly. Also guy’s pants. Also Land’s End will alter any women’s pants before they ship to you – for free!! It won’t work for everyone, but I bet a lot of you could find something to fit.